SwarShala is a wonderful tool for anyone interested in Indian classical music, whether beginner or advanced, by providing means of learning, practicing and composing this style of music. Such a user will be able to create fully customized practice sessions with the required instruments, cycles, pitch, tempo, acceleration, etc... and select them to be played at wish. World music composers will also acknowledge SwarShala as the best tool to create tracks of most Indian instruments for their compositions. 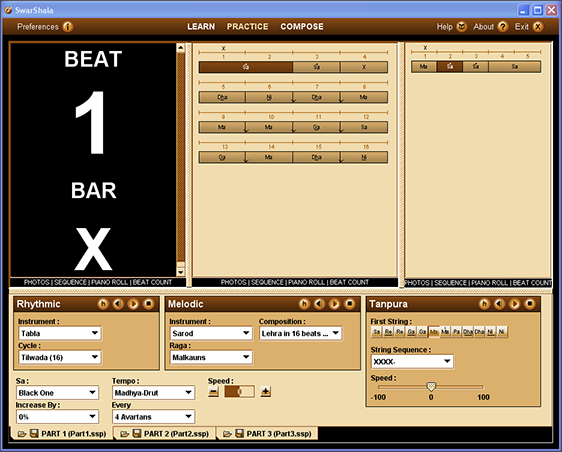 Version 3.1 provides them with a Tracks view on which they can sequence rhythmic/melodic components to create long tracks which can then be exported as wave/aiff or MIDI files. 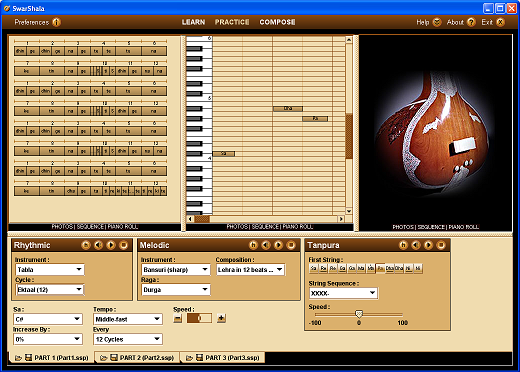 Also those who are more familiar with the western notation will be able to switch to a standard Piano Roll view. Xtra Edition with 74 instruments from all over India and both Tutorials.These different versions can be ordered at our online shop. 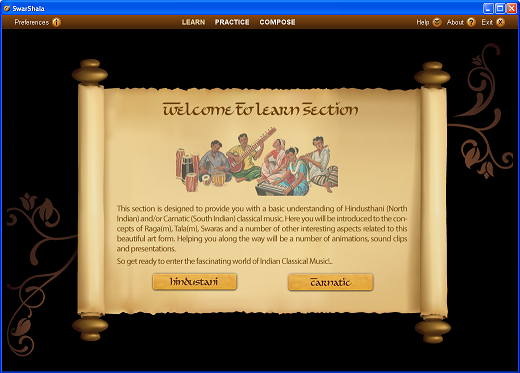 SwarShala version 3 is divided in 3 sections, covering all the requirements of both Indian music lovers/students and composers. You can click on each pane to see a larger picture and description of the pane.